Here is where you will find all blog content related to my senior thesis project, Matrix Pix. My thesis is a web resource that introduces middle schoolers (ages 11-13) to the math behind an image, using convolution matrices to create customizable image filters. This approach builds upon simpler math concepts while grounding them in something kids are already interested in: digital images. How do we make images? How do we change them? Despite today’s vast visual culture, a lack of exploration in how digital images work “under the hood” remains. 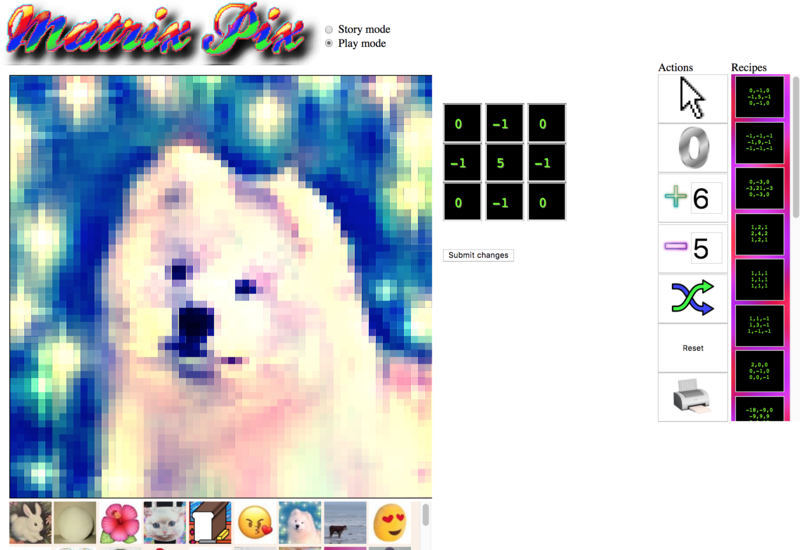 Image processing provides digital application and intuitive visual understanding of mathematical concepts once considered too advanced for middle school. (The Common Core State Standards Initiative pushed matrices to the High School math curriculum two years ago.) In essence, convolution matrices are made up of existing middle school arithmetic operations (adding, multiplying, averaging) and a single three-by-three matrix. Matrix Pix gently familiarizes users with matrices in Story Mode, where a step-by-step interaction walks through the image’s loading and convolution processes. Along the way, a relationship begins to form between the numbers and pixels, which underlines the power and importance of playing with images.